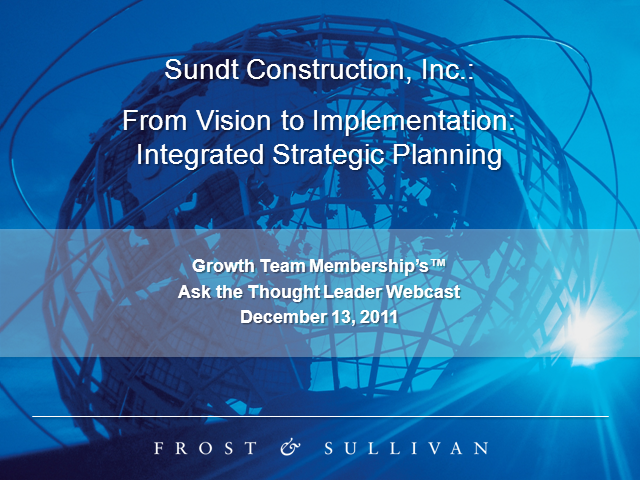 On Tuesday, December 13th , 2011, the Growth Team Membership™ will present a case-based best practice on how the corporate strategy function at Sundt create an integrated strategic planning process—to break down silos, establish a shared corporate visions, and coordinates strategic and tactical planning for effective implementation. Featured Thought Leader: Richard Condit, Chief Administrative Officer at Sundt; and Steve Haines, Founder and CEO of Haines Centre for Strategic Management , will share key lessons learned and participate in a Q&A session. On Thursday, June 12, the Growth Team Membership (GTM) will present the 2014 APAC Marketing Priorities Survey results and hold a discussion on the key findings from this survey. Keith O'Brien, GTM's VP of Global Research, and Darryl Maslia, Coca-Cola's Global Director, Creative Asset Mgmt. Content marketing is on the rise, and for good reason. It helps tell your company’s story, and makes your brand more relatable and interesting to customers. But conducting effective content marketing isn’t easy, irrespective of whether you’re a B2C or B2B company. On Tuesday, March 4, 2014, the Growth Team MembershipTM will present a case-based best practice on how Coca-Cola designed a content-based marketing strategy to drive consumer conversations, inspire purchases, and enhance brand value. Darryl Maslia will share key lessons learned and participate in a live Q&A session. On Thursday, July 18, 2013, the Growth Team MembershipTM will present the 2013 APAC R&D/Innovation and Product Development Priorities Survey Results and hold a discussion on the key findings from this study. On Thursday, June 27th, 2013, the Growth Team MembershipTM will present the 2013 APAC Marketing Priorities Survey Results and hold a discussion on the key findings from this study. A company whose revenue increases more slowly than GDP is five times more likely to succumb, usually through acquisition, than a company that expands more rapidly than GDP. Furthermore, many companies with strong revenue and growth and high shareholder returns compete in "favorable" growth environments. In short, to outperform competitors and succeed in the long term, companies must achieve top-line growth by competing in the right places, and at the right times. This Webcast explores this topic in greater detail and presents Frost & Sullivan’s approach to achieving growth through this critical activity. Successful geographic expansion processes should be repeatable and built upon comprehensive due diligence of a country's attributes, market size, resident or potential competitors, and customer base. This knowledge dramatically raises the odds of a successful entry. An overwhelming number of executives point to innovation as the cornerstone of their companies’ future success. They point to breakthrough innovations as the way to reignite industries, reengage customers, and lead to long-term increases in sales. For those innovations to meet these high expectations, they must be supported by a well-executed introduction to the market. Companies looking to increase share of customer wallet, erode competitors' market share, and boost revenue must incorporate new product (and service) development into their growth strategies. It is for this reason that investment in new product development is considered such a strong predictor of a company's future value. As companies have cut expenses to the bone to contend with the recent recession, most CEOs have come to the basic realization that you can’t cut your way to growth. They have therefore returned to a focus on growing the top line. In fact, Frost & Sullivan’s recent annual CEO survey indicates just that: a vigorous re-centering on new sources of revenue. One path an organization might take to increase revenue is to expand vertically: to take an existing product or service into a new market with an untapped customer base. Successful companies understand where, and how, their customers want to buy, and they do everything they can to reach them through those preferred channels. Enduring, high-performing relationships with distributors are therefore critical to a company’s ability to differentiate from competitors and reach the greatest number of end users. On Wednesday, February 20th, 2013, the Growth Team Membership™ will present a case-based best practice on how HCL Technologies uses a three-step transformation process to invest in a collaborative, employee-focused, customer-centric business model. *The value zone is where the essential work of the company occurs. HCL defines the value zone for the IT outsourcing industry as the interface between employees and customers. Customers are the source of revenue for any company, and their preferences and behaviors largely determine an organization’s success or failure. Indeed, a company’s survival is dependent upon its ability to provide a customer with value, and for that value to translate into top-line growth. While an undeniably large tent, Frost & Sullivan defines “customer strategy” as the process of increasing revenue by better understanding, anticipating, and responding to customers’ changing needs. In spite of the risks associated with M&A, today’s competitive environment makes it nearly impossible for an organization to achieve its growth objectives through organic growth alone. Indeed, recent studies suggest companies that don’t complement internal growth with external activity, such as M&A, find it increasingly difficult to provide the top-line and bottom-line results that shareholders expect. Companies looking to expand into new markets, pursue new innovation opportunities, and hit aggressive targets must therefore build M&A into their growth strategies. Successful companies structure their approach to strategic partnerships strategy around determining the need for a partnership in the first place, assessing their core capabilities, identifying promising market opportunities, and building partnerships that deliver capabilities that allow the organization to pursue those opportunities. They also support top-line growth objectives by grounding strategic partnership decisions in unbiased screening, selection, and deal negotiation, ensuring pursuit of only the best-fit opportunities. New technologies are appearing at an unprecedented rate, and they have produced a wealth of opportunity for those able to capitalize on them. To succeed in today’s environment, executives must be creative, and the companies they lead must be committed to growth through innovation. The choice is stark: Redefine the future by investing in it, or risk being overtaken by those that do. Successful companies scope their technology needs; identify, evaluate, and select from myriad promising opportunities; and commercialize chosen technologies. Learn about what’s been keeping APAC marketing executives up at night. Explore trends in budgets and resource allocations. Discover the “hot topics” in marketing in APAC in 2012. On Tuesday, December 11th, 2012, the Growth Team MembershipTM will present a case-based best practice on how an “Army of One” at Cintas built a competitive intelligence (CI) network of 30,000 that increased sales effectiveness. Featured Thought Leader Troy Pfeffer, Competitive Intelligence Director at Cintas, will share key lessons learned and participate in a Q&A session. During the Ask the Thought Leader webcast, the Growth Team MembershipTM presents a Best Practice Guidebook, which is a step-by-step profile of the activities performed by a company to solve a pressing business challenge. The webcast features a “Thought Leader,” the executive responsible for implementing the best practice, to provide key lessons learned and lead a live Q&A session.